Tonight: a three course meal. For starters we have a sidewalk made of .060″ styrene painted with textured spraypaint (sandstone) and given a wash of india ink and alcohol. The .060 matches the height of some card stock I have normally used for matting artwork (thanks wifey!). I use the styrene for the visible areas so I can scribe expansion cracks, carve, and paint it. The mat board makes a level surface for structures. As a main dish, we are surving up a kitbash of Walthers’ George Roberts publishing that is going to a become National Transfer & Storage warehouse. It adds a nice mass to one end of the layout, but I’m not using the entire kit. Same sandstone as above and boxcar red by Floquil. Finally I’m painting a cabose that I picked up at a model railroad show for $1. I’m going to turn it into a crew office for the RIP track that runs beside National Transfer & Storage. Heavy weathered and overgrown. I’ll follow up the bench shot with a photo once everything is in place. Just found a neat resource on TrainLife.com. RailModel Journal Sep 99 has a couple of articles on modeling NYC after the prototype. Be sure to check out the index of city modeling articles on page 49. 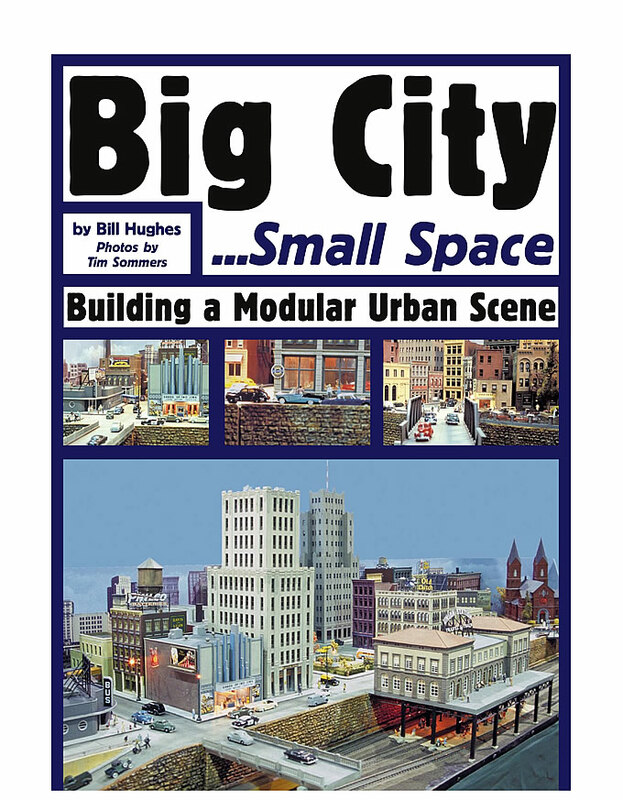 Also found “Big City … Small Space” a nice article on building a modular urban scene by Bill Hughes in the March 2002 issue of Model Railroading magazine. I started out with a plan based on Shortliner Jack’s Ness Street Yard. [I ran across this and some other good resources in the forum post at Trans.com] As I started to lay it out, things became a little hairy, especially at the crossing. I wanted some good and reliable trackwork and it just wasn’t coming together. Since I hadn’t done this in a while, I decided to back off and keep it simple.I knew I wanted something with a run around like John Allen’s Timesaver. I didn’t want to design a timesaver specifically, but basically a run-around track with spurs shooting off the ends. I came across Gateway Central XV, a project layout of the Gateway NMRA. That seemed to fill the ticket. I had a little more room, so after tinkering a while, I mimicked the plan with flextrak and added a spur. I also liked the “look and feel” of Gateway XV, so that was a good starting point and something to shoot for. There are no grades and no below-the-tracks scenery elevations. Like I said, I wanted to keep it simple. Maybe someday, or on the next layout! Track is Atlas nickel silver code 100 sectional that I picked up on eBay. It is just so readily available and cheap that I couldn’t resist. At this point I didn’t really care about the profile being out of scale. (We’re having fun, remember?) Flextrack and additional sections I bought new from my local hobby store. Benchwork was an old standby – a sheet of 1/2″ plywood. I purchased a 4×8 at my local home supply store and had them rip a section 30″ wide. I knew my closet wasn’t quite 8′, so I went home and cut that to fit. I experimented with various support systems and ended up usingaround-the-wall 2×4’s to act as shelving support for 2×4 cross pieces. This was a simple and elegant solution. I wanted to keep the molding around the edge of the closet doors, so the front operator area has no support. This works fine as long as visitors don’t lean on the table. Adding shelving support. 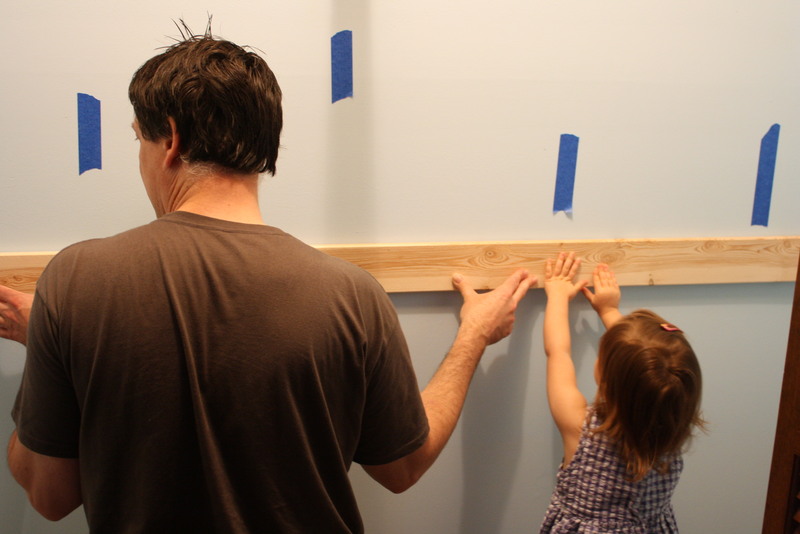 The blue painter's tape marks the wall studs. I also wanted the table top to be a single piece so I could just pop it in. The physics just didn’t work with the length and height, so I made a cross cut at about 12″ where the front opening started. The joint lays ontop of one of the moveable cross support pieces. To position the table top, the larger piece goes in first the position of the cross pieces if finalized. The smaller piece can just sit down in place. Breakdown is LIFO (last in, first out) manner with the smaller piece of sub roadbed coming out first. The design works quite well as the railroad is quite moveable (not really portable or modular, but that’s a different blog). I wait until I have several items that need attention on the backside and pop the table top out for a couple of weeks to work. Visitors coming? Pop ‘er back in! A coat of cheap-o earth tone latex paint finished the prep for the table top. 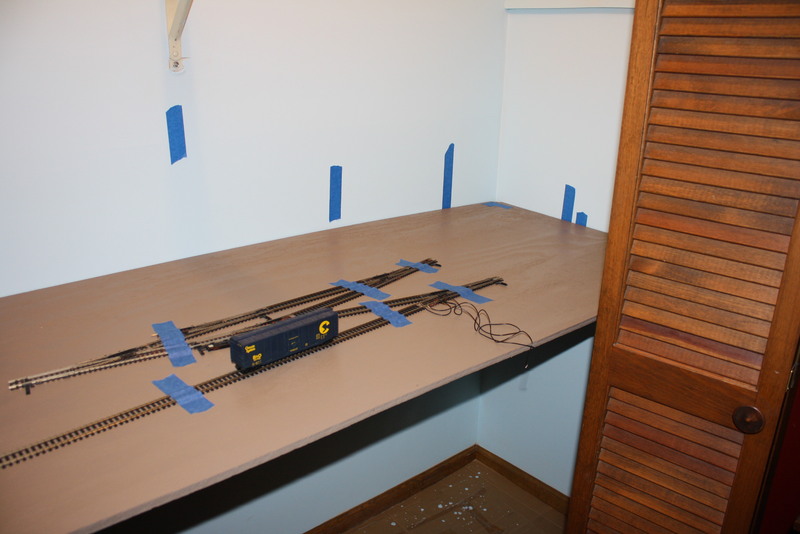 I finalized the track plan with the table outside of the closet, then held the key components in place (the run around) with tape as I placed the table top into position. I determined the final track placement in accordance to the size of my buildings. Doing this with the sub roadbed in place helped with the spacing and feel of the layout. Track was laid directly on the plywood sub roadbed and temporily spiked in place. After final tinkering, the track was glued down with a 50/50 mix of white glue and water. Layout height is 38 inches so kids can see it. I just can’t stand armpit height layouts. I don’t think any gain in realism from low viewing angles is really worth it. I’ve never heard anyone say of a high layout “Oh, I thought I was going to get hit by a real train there for a minute!”. I would rather my guests (and me) be able to see the areas that have been modeled, so I like my layouts lower. Still having fun, right? I decided to put the layout in the closet of our spare room. 30″ x 88″. I thought that sounded small, until I got into it. It is just enough size to have some realistic operation and also model in detail. Removable. Note I didn’t say moveable. I wanted to be able to take the layout out of closet with relative easy to work on it. I did not necessarily want a mobile layout that I could toss in the car and cart around. More on that later. Fairly lightweight. I wanted to be able to move it by myself. I knew basically half a 4×8′ piece of plywood would be OK, so I went with that. Urban setting so I could do some detailed city modeling, which I had not done before to any real extent. Standard cab control. Keep it simple for a single operator. I’m not a member of a club and almost exclusively operate by myself. I grew up in B&O country during the heyday of the Chessie system. I love those old tains and it’s natural for me to want to model them. Years later, I’m living in CSX land and that is what I see most every day near my house. Modeling the modern day CSX gives me the chance to update my roster, while still being able to use the occasional throwback. The location is a generical urban setting. Somewhere in the Mid-Atlantic I suppose. Only a few years of my life have I ever spent living in a proper city, so I guess I’m content to freelance. Lately, I have been researching how modern freight moves through real life cities, most notably Atlanta. A word about freelancing. If your new to the hobby and tring to find your niche, go for it. Picking a prototype is fine, but don’t stress out. Make your pike the way you want. If you want to run your trains loopty-loop, that’s fine. If you want to focus on modeling or scenery over operation, that’s all good, too. New Haven, Canandian National, and Santa Fe cars in the same consist? You betcha! I’m looking forward to working in my passenger cars from Austria and Japan onto my layout. Be sure to give everything a try. I’m enjoying researching and modeling a specific prototype more and more. Whatever your style, don’t critize others who have a different style.